The iridescent fire and bright color of mystic topaz makes it a unique and lovely choice for an engagement ring. Before you start shopping, it's a good idea to get a sense of the styles available and understand a bit about this extraordinary coated gem. 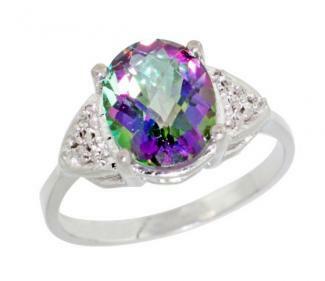 Although it may not be easy to find a variety of mystic topaz options in your local jewelry store, just about every style of gemstone ring you can imagine can be found online. From solitaires to diamond accents, the choice is yours. Ultimately, the right style for you comes down to personal preference. A solitaire is a classic choice for an engagement ring. Because of its simplicity, it places the visual focus on the iridescent beauty of the mystic topaz. Depending on the height of the setting, you can usually wear the solitaire on the same finger as your wedding band. In some cases, you'll need to choose a special curved wedding ring or move the engagement ring to a different finger. Mystic Topaz Solitaire:- This simple and lovely ring from My Solitaire features a 1.33-carat oval mystic topaz set low in a 14k white gold band. Ten white gold prongs hold the stone securely in place and protect it from scratches. This ring retails for about $420. Tommaso Cushion Cut Mystic Topaz Solitaire - A seven-millimeter mystic topaz glitters in a 14k white gold set in a prong setting. The cushion cut adds sparkle to the beautiful gem, making it one of a kind. This ring retails for about $200. 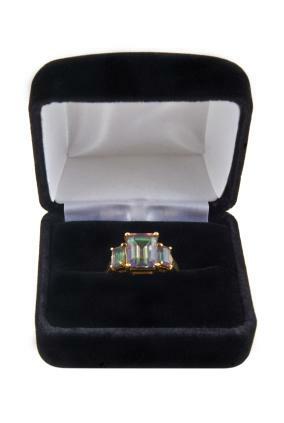 Octagon Mystic Topaz Ring - This ring sets off the mystic topaz to really shine. The large, center stone is flanked by three white topazes on each size and is set in a sterling silver band. This beauty retails for just under $40. 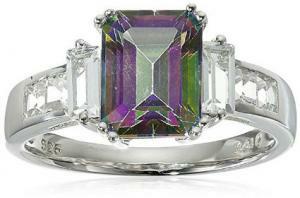 Many beautiful engagement rings feature a central mystic topaz accented by diamonds. How you wear this type of ring will depend on the height of the setting. A high setting can often accommodate a wedding band, while a lower setting means you'll need a curved band or wrap. Cushion Cut Mystic Topaz and Diamond Ring - This ring from SuperJeweler showcases a two-carat cushion-cut mystic topaz surrounded by a halo of colorless diamonds in an antique-inspired 14k white gold setting. It retails for about $800. Diamond and Mystic Topaz Ring - This pretty ring from Amazon.com has a 2.4-carat oval mystic topaz with triangles of pave-set diamonds on either side of the center gem. The 10k white gold setting glows softly. This ring retails for about $250. Before you begin shopping for your ring, it helps to know a few important facts about mystic topaz. Keep the following in mind. Mystic topaz is not a naturally-occurring stone. It's made from clear topaz that has been coated with a thin film of color. Typically, this coating is permanent and won't wear off, but it does require care. This type of stone is sensitive to heat, ultrasonic cleaning, abrasion, acids, and polishing. Azotic Coating Technology, Inc., the company that produces this type of topaz coating, recommends that consumers treat their coated topaz like a pearl, opal, or other very delicate gem. If a company says that it sells "natural" mystic topaz, buy from someone else, because all topaz is treated. No matter how lovely the coating is, it needs to be applied to a clear topaz with a good cut and clarity to create a beautiful effect. Before you buy, have your stone examined by a certified gemologist or ask to see its certificate of authenticity. This will provide information about the features of your gem and ensure that you are buying a quality engagement ring. Most people expect to wear their engagement ring a lot of the time, so your ring will need to stand up to some daily wear and abuse. While topaz is an eight on the Mohs Hardness Scale, according to the Gemological Institute of America, the coating on mystic topaz can be prone to scratching. You can minimize this problem if you choose a ring with a bezel setting or a generally low profile. No matter which style or color your choose, your mystic topaz engagement ring will be unique and lovely. The fiery beauty of this gem attracts attention, especially in the form of an engagement ring.